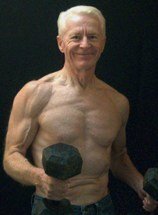 The Gray Iron Fitness Newsletter, Issue #95, Were musclemen of the past superior? What most people know about the 1936 Olympics is that Jesse Owens won four Gold Medals in track and field. Not many will know that a young man named John Carroll Grimek represented the United States in weightlifting. Grimek, a powerful strength athlete, also had the flexibility of a contortionist, and was a reluctant bodybuilder who won the Mr. America title twice, the only man to do that. Can you imagine some of today’s steroid-pumped pro-bodybuilders with Grimek’s abilities? I can’t. Take a look. Or take the example of Jack LaLanne. Here was a man you saw on muscle magazine covers. But LaLanne not only looked strong, healthy and athletic – he was strong, healthy and athletic. See pictures of him towing boats while swimming handcuffed, or hand balancing at Muscle Beach, or watch him doing a thousand consecutive push-ups. He’s a legend. Consider Tommy Kono, who could be the greatest Olympic lifter in history: a Gold Medalist in 1952 and ’56; Silver Medalist in 1960; a seven time world champion who established 26 world records and seven Olympic records in four different weight classes. By the way, in his spare time he won Mr. World and Mr. Universe titles. No mere poser, he walked the talk. How about Roy Hilligenn? He combined bodybuilding workouts with Olympic lifting, was good at tumbling and hand balancing and liked to entertain by doing back-flips, often in spaces so small you would not think there would be room to do them. He was Mr. America in 1951. And at 173 pounds, he equaled the world record in the clean & jerk, lifting 375 lbs. When he was slightly heavier, he did 405, an unofficial world record then. I’ll stop here, but my list could go on. The point is the champs before the steroid era were actually as healthy, athletic, and as strong as they looked. In those days, a man or woman’s quest for actual physical health was closely intertwined with the desire for more strength and to look good. Strength and health were sought together. Some might argue that contemporary training methods must be superior, as trial and error and scientific study have moved us forward with the passage of time. Maybe. But strongman-writers like Brooks Kubic argue persuasively that “old school” training, using only basic lifts and exercises, produce the best results. Take away their pharmaceuticals and the pros of today would certainly be healthier people, long-term. But without their chemical crutches, could they have measured up athletically to men like Grimek, LaLanne, Kono, or Hilligenn? Some might be genetically gifted enough to do so, if properly trained. But we can never know. There are no healthy shortcuts to better health and stronger bodies. Regular basic exercise workouts and practical balanced nutrition is the only sure path to improvement and longevity. The formula is same for people of all ages. It is only the degree of training intensity and duration that must be adjusted for seniors.